Aljanabi’s achievements led the Foundation for Grossmont & Cuyamaca Community Colleges to award him at Lee Roper Memorial Scholarship, which is named after one of Grossmont College’s first instructors. Aljanabi was among the 132 students honored during a recent gala at Grossmont College for their academic accomplishments. Aljanabi’s journey to Grossmont College was set into motion after the 2003 U.S.-led invasion of Iraq. Aljanabi’s family ultimately fled to Syria, hiring a driver and making their way through countless checkpoints en route to Damascus. Surviving on savings, they lived in Syria for five years before being cleared to move to the United States. Before long, Aljanabi could more than hold his own conversing in English. But the family, looking for better employment opportunities, moved to Maine and then Michigan, before arthritis suffered by Aljanabi’s mom led the family to come to California. 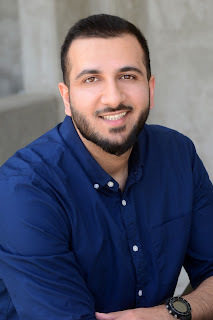 Aljanabi graduates with two associate degrees from Grossmont College this spring. His goal is to earn a master’s degree in orthotics and prosthetics, then work as an orthopedic specialist caring for those with artificial limbs.